Home / Blog / Influencer Marketing / Are micro-influencers effective brand ambassadors? Are micro-influencers effective brand ambassadors? There certainly is one resounding buzzword when it comes to 2019 marketing strategies; micro-influencers. And while their audience size may be modest, their influence certainly is not! But are they effective in boosting your bottom line as brand ambassadors? The truth is that they can be highly beneficial to your influencer marketing efforts and in achieving your communication goals. Our WINK micro-influencers have a range of followers from 5-50k and all with high engagement. In fact, 84% of our micro-influencers have better engagement rates that Kim Kardashian herself! So instead of spending thousands, you can effectively reach your desired audience by engaging a micro-influencer at a lower cost. Forbes’ 2018 article titled “Micro-influencers: The Marketing Force of the Future?” stated that “It’s not necessarily the number of followers as much as how engaged that audience is. Micro-influencers have specific niche audiences and are deeply connected to them.” You can forget about the “infleuncer movement” being all about the number of followers, and instead focus on the actual effectiveness of the reach and how the audience is reacting to posts. In 2018, marketers began to notice that once an account is over a certain size (±30k), fewer people would bother to engage. This has many brands questioning the value of raising capital for incredibly expensive celebrity endorsement deals when it’s possible to get far more response from partnering with a more cost-efficient micro-influencer. As users on platforms like Facebook and Instagram continue to grow, the cost of advertising and promoting will grow too. It’s increasingly important to find the most return on investment as possible. Macro-influencers and celebrities often have a lower average engagement rate on brand collaborations. On the other hand, micro-influencers usually enjoy a very loyal and responsive following. This is because it’s still growing and made up of people they have met, people who have followed them from the beginning, people who generally love their content and people in their personal friends and family network. In other words, people who listen when they post about something. What makes an audience more engaged micro-influencers? Everything! It comes down to their tone, authenticity, personality, content aesthetic, topic niche, and most importantly, their ability to be personal with their audience. They excite and ignite their followers into far more daily and weekly conversations than macro-influencers. Authentically getting your brand in front of their fans in amongst this buzz and excitement means earning some of that ferocious loyalty for yourself too. At the end of the day, there is true value in understanding the power and value of engagement in the influencer marketing space. By leveraging these ‘smaller’ influencers in your strategy, any brand can create a winning formula for success through authentic content and a genuine desire to understand the audience. If you’d like to find these kinds of personalities in Australia, don’t hesitate to contact our talent managers! Have some questions? Feel free to get in touch! You can count on our talent managers to respond quickly to your enquiries and putting forward suitable candidates for your specific brief. Our agency is made up of 7 divisions; Male, Female, Sports, Classics, Youth, Promotional & Influencers. We have specialised bookers within these divisions to ensure appropriate management of each individual. 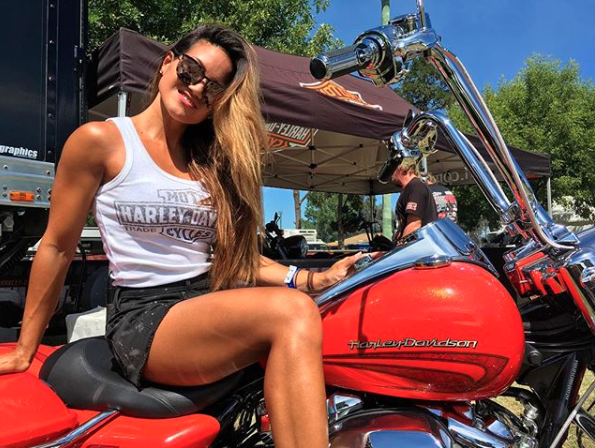 We love working for Harley-Davidson and the Summernats Festival each year! The delicious Natalie for the delicious Perrier Jouet. We chatted with Tamara Meyer, a WINK sports model, on her role in TM Fitness. This is your chance to chat one on one with your booker and go through any outstanding questions or issues you have and get the help you require.